Horse hair sporrans are considered on the fancy end of piper dress, often see in military bands along with doublets, feather bonnets, cross-belts, plaids, spats and the like. These sporrans are a bit of an investment, usually running two or three hundred dollars for a good quality model. Much like human hair, the horse hair can collect dirt and grime. But fortunately, also like human hair, it can be washed. Most hair shampoos will work just fine, but there are those who prefer shampoo specifically marketed for horses, such as products like "Cowboy Magic" or "Mane & Tail." These horse shampoos are often available specifically for black or white hair and may contain conditioners. 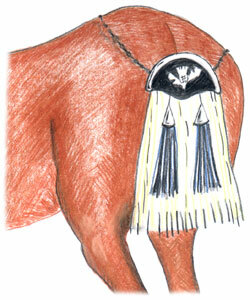 Often, the cantle (the metal top part of the sporran) can be removed to facilitate cleaning. Any metal parts that you don't remove should be dried immediately after the cleaning process. The hair is usually stitched in 4 or 5 rows to a piece of leather. You want to avoid washing where the hair is bound together, in particular wetting any leather components. Fill a large bowl or bucket with warm soapy water, then start washing. You'll find that the hair will float, so you can either hold the hair underwater or instead pour your solution over the hair in a controlled manner until it's saturated. After working out the dirt, rinse the hair a few times with clean water. Repeat a wash bath if the rinse water continues to be dirty. If you'd like to go the extra mile for your sporran, you can condition the hair. Conditioner will make the hair easier to comb and you'll be less likely to accidentally pull out hair when combing. Follow the directions for the conditioner. Usually, this means rinsing. If you use a spray conditioner, avoid using too much as this will make the hair gummy. Dry the hair by pressing it in a towel. Or if you wish, hold the sporran by chain, take it outside and swing it around over your head then bring it back in and dab it with a towel. You'll want to brush the sporran thoroughly, starting from the bottom, with a wide tooth comb to remove tangles and knots. This can be a painstaking process and while you may lose a few hairs anyway, you may lose a full handful if you get aggressive! Be patient! You could benefit by brushing while watching something on television to pass the time. Once you have it fully combed out, hang up the sporran. It's not a bad idea to repeat combing periodically as it dries. A quick note about stained sporrans. You may be tempted to bleach dirty hair, but beach is harsh and can remove the natural oils which may cause the hair to become brittle. If you can't live with the sporran being off color, bluing (such as Mrs. Stewart's® Bluing) may help. It contains no beach but instead adds a mild blue dye to counteract the unsightly colors. Bluing is typically very concentrated, so start out very, very diluted (such as a few drops) and add more bluing if necessary. It's a good idea to test first on a small area on the back side. There are two things that might surprise you with this process. One, the amount of dirt that you may find coming out of the sporran. Two, how fluffy your clean sporran may appear compared to its former filthy appearance. A loose plastic garment bag hanging around the sporran can prevent the hair from getting too out of control. If the sporran is moist, let it air dry completely before hanging it up in a bag. To really control the shape, some pipers recommend putting the sporran in a newspaper's plastic rain bag or a plastic loaf of bread bag or even a nylon stocking leg with the top and bottom cut off. Some have found that thisparticularly the stocking methodmakes the sporran too tubular and use a loose garment bag or nothing at all. One piper described as obvious appearance of the sporrans which were stored in a nylon stocking. Some pipers help counteract this undesireable appearance by placing "stocking stuffed" sporrans flat in a drawer. If you want to be extra particular, you can cut a thin plastic or cardboard tube to slide around the tassels to help keep their shape. Later when storing a horse hair sporran after use, you'll want to hang it up immediately after use and not toss it into a pile where the hair can get tangled. Take the time to gently brush it out before putting it away. If take good care of your sporran, it will look good and last for decades, and perhaps, even centuries! This page last updated Tuesday, March 30, 2010. Page first created in December 10, 2006.